Redundancy is the watchword whenever you deal with file storage so it never hurts to try out a new online file service. 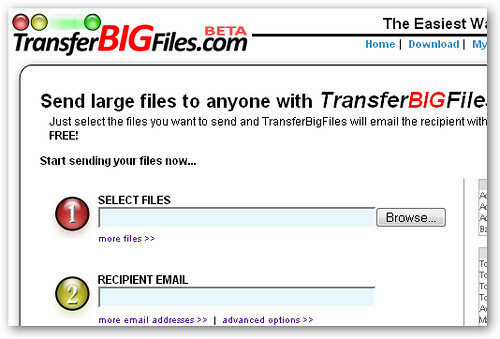 In the spirit of name-as-function, TransferBigFiles does just what you'd think. It's built to help you send large files to other people. Files can be up to 2 GB in size, and you get unlimited storage. They are stored for up to 5 days unless you install and use the drag-and-drop DropZone Client, which extends storage time to 10 days. They really mean it when they talk about sending files to anyone. You have to specify an email address to upload files, and you can only get the download link via email message. In a neat move, TransferBigFiles shows you their web stats so you can tell that, so far, over 30 TB of files have been transferred with an average size of 51 MB.